This article on autism in fiction is part of the Science in Sci-fi, Fact in Fantasy blog series. Each week, we tackle one of the scientific or technological concepts pervasive in sci-fi (space travel, genetic engineering, artificial intelligence, etc.) with input from an expert. Please join the mailing list to be notified every time new content is posted. Josh Michaels is the pseudonym of Dr. Joel Shulkin, a developmental-behavioral pediatrician and former USAF physician with over fifteen years’ experience diagnosing and treating children with developmental disorders including autism. As Josh Michaels, he writes medical thrillers and dabbles in SF/F thrillers. He is represented by literary agent Lynnette Novak of the Seymour Agency. You can find him on Twitter, Facebook, and on his author website. Before Dustin Hoffman portrayed Raymond Babbitt in 1988’s Rain Man, few people outside of the medical community had ever heard of autism. Today, with one in sixty-five children diagnosed, it’s rare to find someone who has never met an autistic person. Several recent TV shows and novels, including SF/F stories, feature autistic characters—some accurate, some not. 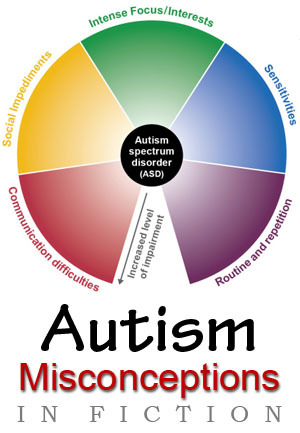 Misrepresenting autism is dangerous on two levels. First, autism has a historical stigma that is finally eroding. Portraying autistic individuals inaccurately may perpetuate misunderstanding as well as build obstacles to support and funding for services. Second, unlike Raymond Babbitt, most autistic individuals are avid readers, and many are also writers. Fantasy & Science-Fiction are often preferred genres for autistic readers, who need accurate representation and voice in books as much as any other marginalized group. The term “autism” was first coined by Leo Kanner in 1943 to describe the repetitive, self-directed behaviors he observed in eleven boys who had poor language skills. A year later, Hans Asperger described children who displayed autistic behaviors but had high nonverbal IQ and advanced vocabularies. For decades, Autistic Disorder and Asperger Disorder were seen as two separate disorders. It wouldn’t be until 2012 that the terms would be eliminated, replaced by one common term: Autism Spectrum Disorder. The autism spectrum can vary widely, from individuals who are nonverbal and aloof to those who are genius-level and socially engaged. However, autistic individuals share certain characteristics, as outlined in the Diagnostic Statistics Manual, 5th Edition. Autistics struggle with social reciprocity. This doesn’t mean that they all shun social interactions. Many are quite friendly. But they have trouble with the back-and-forth nature of interaction and conversation. There tends to be a one-sidedness, often making them seem self-absorbed. They have difficulty sustaining eye contact, following social conventions, and developing relationships. Autistics may have problems with spoken language, especially non-literal language, but where they really struggle is unspoken language—facial expressions, gestures, social cues. Their own expressions may seem flat or inappropriate, and they may be animated but not descriptive with their hands. They may come across as socially awkward. Autistics display some form of cognitive rigidity and repetitiveness. This might mean trouble with change and insistence on sameness, perseveration on specific subjects or events, repetitive speech or movements, and over- or under-response to sensory information. Although these behaviors are the ones most people think of as being “autistic,” they are actually the least specific to autism, as highly anxious individuals often have similar behaviors. When people hear the term “autistic,” many think of Raymond Babbitt, the eponymous character in Rain Man. Raymond was one of a rare group of individuals known as “savants.” Savants display extreme skill in one or two areas, such as mathematics or music ability, while they are otherwise intellectually disabled. You might recall that Raymond could count cards in blackjack but didn’t know which cost more: a car or a candy bar. Autism is essentially uneven learning. Autistic children often excel at memorization, but struggle with problem-solving and reasoning. Their way of thinking is often different. They may approach a problem by connecting patterns where a typical person would try to reason verbally. They may recall every detail about the Civil War, but struggle to explain why the war occurred. Without intervention and support, those differences can become more pronounced over time. Today, only 30% of autistic people are intellectually disabled (IQ lower than 70), according to the CDC’s 2018 Morbidity and Mortality Weekly Report. In fact, many are highly intelligent. Furthermore, contrary to what popular fiction, such as ABC’s The Good Doctor, would have you believe, most autistic people are not savants. They may be very good at what they do, and they are likely passionate about it, but they don’t have magic powers. They want to be accepted for who they are, not what they can do. Too often in fiction, autistic characters are portrayed as something to be pitied, rather than someone. They’re the first to die when tragedy strikes. They’re the burdens weighing down the protagonist. They’re the unwitting butts of jokes (“Oh, he did something autistic again!”). Or they’re considered invaluable unless they have some unique talent. Autistic individuals are real people, with thoughts, feelings, and desires like everyone else. Each is a unique individual. They have value beyond some extraordinary talent or superpower. While many have difficulty dealing with change, they have the ability to grow and develop just like everyone else. Which means they can have quite interesting character arcs, especially when faced with something new that disrupts their world. Autistics are often portrayed as disconnected from “the real world,” shut off and isolated. As a result, readers miss out on understanding their inner thoughts and motives. But the opposite is actually true. Autistic people are often over-aware and overwhelmed by the relentless sensory information of the world, but their responses vary widely. Some may be bothered by loud noises, while others don’t mind them. Some may not want to be touched, while others crave affection. As a writer, it’s important to think about what makes your character unique and how those qualities play into the story. One of the best ways to show your autistic character’s inner world is through first-person perspective. The most well-known example is Mark Haddon’s The Curious Incident of the Dog in the Night-Time, which tells the story through Christopher Boone’s eyes, right down to chapter numbers using only prime numbers. Christopher is an unreliable narrator, as his emphasis on tangible details causes him to miss social-emotional clues about his parents’ role in the mystery he’s trying to solve. This adds an intriguing element to the story while allowing Christopher to grow emotionally. A more recent example is Elizabeth Moone’s The Speed of Dark, wherein Lou Arrendale describes how and why he behaves a certain way. He acknowledges how neurotypical people view him and his feelings about it: “What I mean is I know what I like and want, and she does not, and I do not want to like or want what she wants me to like or want.” The reader understands and appreciates how Lou thinks and feels, and thereby cares enough about him to want him to succeed. Most autistic characters in fiction are white males. While autism is more common in boys, there are plenty of autistic girls. Autism is common across the globe and affects every race, ethnicity, and level of socioeconomic status. An author who wants to break away from the pack should look for diversity in a way that fits the story. How about a LGBTQ+ autistic? Yes, they exist. No, there aren’t many stories out there about them, and they desperately need to see themselves represented in fiction. Finally, it’s important for the author to carefully consider the autistic character’s goal. Too often in fiction, it’s to be “cured,” or at least to become less autistic. Or, a parent is the main character, searching desperately for a cure for their autistic child, who serves as little more than a vehicle for the parent’s journey to self-fulfillment. Autistic people want to be accepted. They want to succeed. They want to learn. Or maybe they just want to fight a dragon or explore a new planet. Autistic characters can add diversity and distinction to your story. They often have special mannerisms and characteristics. Their unique responses and approaches to problems make them intriguing characters. But it’s important to treat them as real people, not as stereotypes or caricatures. Develop their character arcs, personalities, and inner worlds and allow your reader to understand and love them, just as you would any other character.